"Look at all the butternuts I harvested, honey!" I said proudly. "And we've got four more left in the garden." Mark glanced over at my 22 pounds of butternuts and replied --- "Four more baskets?" Shame-faced, I had to shake my head no. 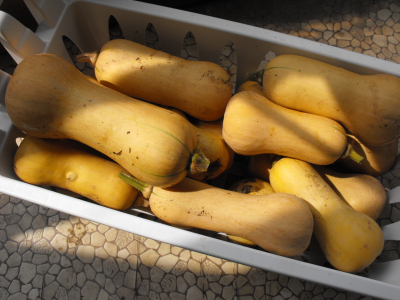 I only had four more squash in the garden. 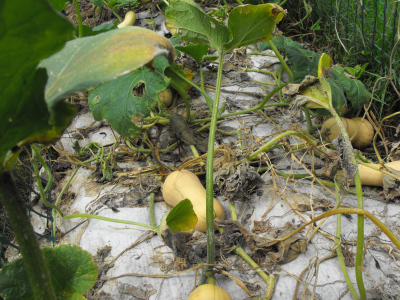 If you planted your butternuts a bit late (which would have been smart), they might not be ready to harvest yet. Wait until your vines are dying back, your fruits are fully tan, and the stems have begun to brown (but be absolutely certain to harvest before the first frost.) Then carefully cut each butternut off the vine, leaving an inch of stem on the fruit. Never toss the butternuts around --- even though they look hardy, they actually bruise quite quickly if treated harshly. Some people wash their butternuts gently in a solution of bleach water after harvesting to kill off any fungi living on the skin, but I've had good luck storing our butternuts as is. For best flavor, allow the squash to cure at 80 to 85 degrees Fahrenheit for a couple of weeks, then store in a cool (50 to 60 F), dry place. We keep our butternuts in a kitchen cabinet and eat them until the middle of the winter...or until we run out. Our homemade chicken water ensures that your flock doesn't run out of what they need most --- water. We love butternut squash as well. What do you mean by curing them for a week at 80 to 85 degrees? Just let them sit somewhere exposed to air at warm temperatures for a week or two --- we have ours sitting in a basket on the kitchen floor. Technically, you're supposed to store the squash at a cooler temperature, and I think if you throw them right into a cool place, they don't develop a tough enough rind to make them last through the winter. On the other hand, I've read on a couple of different extension service websites that some folks think curing isn't actually necessary for butternuts. (And it's supposed to be a bad idea for acorn squash, making them spoil quicker.) So I wouldn't worry too much about it! Just don't put them away damp.